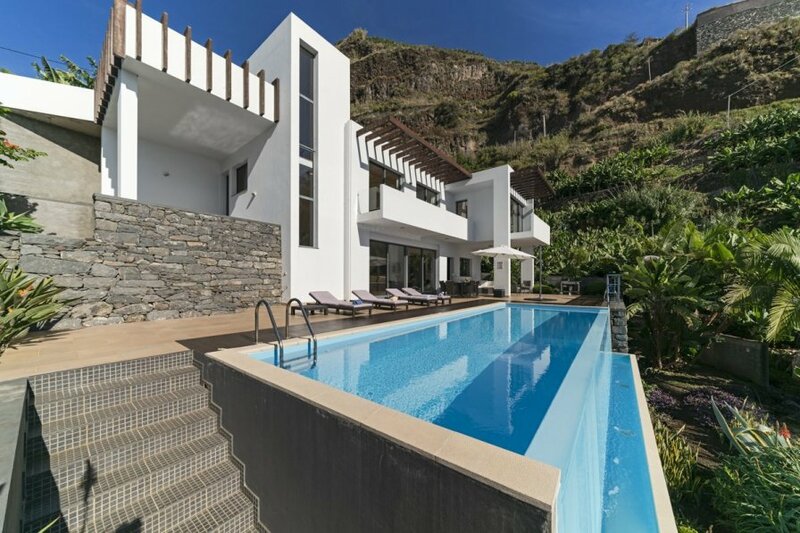 Villa Trocaz is a lovely and contemporary holiday home situated in the resort of Calheta. Villa Trocaz is a lovely and contemporary holiday home situated in the resort of Calheta. Guests will adore gazing over the horizon from this villa as it's perfectly located amongst the glorious countryside beside the sea. The villa benefits from a beautiful and unique design with striking Cubist architecture. Guests will enter the home and be led straight to the lower floor via a stairway that leads down to the bedrooms. All bedrooms benefit from dazzling natural light and stellar views over the ocean. The rooms are enhanced by rich colours, soft bedding and smooth laminate floors. Waking up to such a remarkable morning view will be a great motivational way to begin your day. Guests lucky enough to stay in the master bedroom will be delighted with the rooms en-suite shower room and wonderful views over the surrounding nature. The room also has access to a private and shared balcony. One of the other bedrooms comes equipped with a study desk, for catching up on some work while away. The bright and spacious living area sees modern furniture surround a flat screen television. Here, guests can indulge in evenings inside with a movie. The area also contains a pleasant dining area with an elegant glass table and chairs. The kitchen, which sits adjacent to the living area is generously equipped with modern appliances, so if you chose to cook while on your holiday, it'll be a breeze. One of the most superb features of the home is the gorgeous sun terrace which contains a luxurious infinity pool and waterfall. The terrace also comes with a small seating area and sun lounges, where you can simply just laze the days away and take in views of the surrounding green hills and banana trees. Villa Trocaz is a really stylish and modern 3-bedroom. With astonishing views of the Calheta countryside from the infinity swimming pool, you won't want to spend much time indoors. Madeira's stunning capital Funchal is only 30-minutes away from Trocaz and is a nature lovers paradise. Santa Catarina Park is an idyllic natural location where you can enjoy the simplicity of watching swans and graceful cruise ships elegantly glide across the lake. Full of hills, the park is a beautiful site in itself with plenty of grass to relax on while taking in views of Funchal. The park also contains a cafe serving homemade lemonade and exotic trees from the world over. Once you've taken it all in, you can explore one of the restaurants and bars located within five minutes of the park. Madeira Botanical Garden also lies in Funchal and is a serene spot where some of the most attractive plants and flowers can be seen and enjoyed. Located on top of the hill, the gardens benefit from a phenomenal view over Funchal and the sea. From so high up, you can really appreciate the city of Funchal and all of the excellent nature that comes with it. This place will leave you feeling really inspired and once you've explored, take a seat in the cafe and indulge in a bite eat. The gardens also feature a Museum of Natural History which contains collections of rocks, corals, fossils and embalmed birds, fish and other animals. Funchal Airport is only a 10-minute drive away from Villa Trocaz.